The 2018 Ford Explorer is the latest version of Ford’s mid-size three-row SUV. Since it was first introduced as a 1991 model, it has been a mainstay of the Ford lineup. More than seven million Explorers have been sold since 1991, and it is currently the sales leader in its segment, outselling all competitors by a comfortable margin. 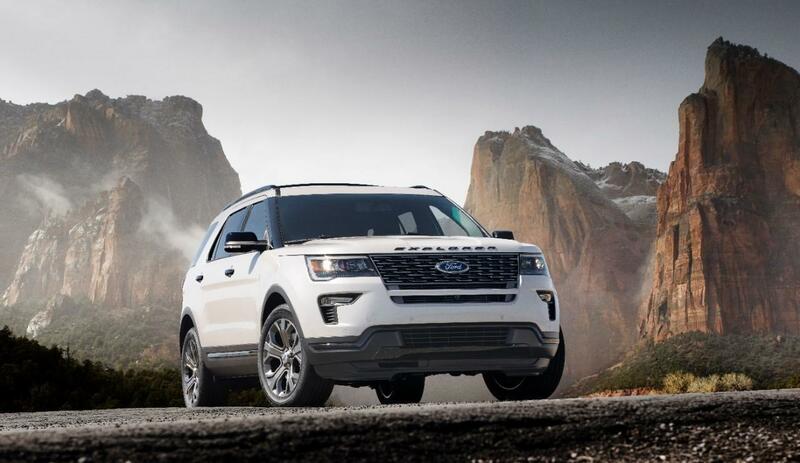 The 2018 Explorer is a freshly updated version of the current model, incorporating freshened styling, more technology, and more choice for consumers. These updates are intended to keep the Explorer at the head of its SUV class, which continues to grow in volume as both young families and older adults gravitate to the SUV body style and away from sedans. The 2018 Ford Explorer will offer a built-in 4G LTE modem with Wi-Fi hotspot. It will support up to ten different devices at one time, at distances up to fifteen meters from the Explorer. SYNC Connect is another featured technology. This lets owners use the FordPass app on their phones to connect remotely with the 2018 Explorer. FordPass functions include locking, unlocking, and starting the vehicle, pinpointing the vehicle’s location, and accessing diagnostic information on the vehicle’s systems. Available driver assistance technologies include enhanced active park assist, which helps with parallel and perpendicular parking; park-out assist, which helps with pulling out of parallel parking spots; plus intelligent all-wheel drive with Terrain Management System. The 2018 Ford Explorer is available in five different trim levels: Explorer, Explorer XLT, Explorer Limited, Explorer Sport, and Explorer Platinum. A 3.5L V6 engine with 290 horsepower is standard on Explorer and Explorer XLT, and optional on Explorer Limited. A 2.3L EcoBoost turbocharged four-cylinder engine with 280 horsepower is standard on Explorer Limited, and optional on Explorer and Explorer XLT. The top of the line engine is a 3.5L turbo V6 with 365 horsepower. It is standard on Explorer Sport and Explorer Platinum. Intelligent all-wheel drive is available on Explorer, Explorer XLT, and Explorer Limited. It is standard on Explorer Sport, and Explorer Platinum. For 2018, the Ford Explorer will offer four new exterior paint colours: Platinum Dune Tricoat, Blue Metallic, Cinnamon Glaze, and Burgundy Velvet Tinted Clearcoat. In addition, there will be five new wheel designs to choose from. The 2018 Ford Explorer will arrive at Van Isle Ford in Port Alberni this fall. Continuous refinement and the addition of the latest infotainment and driver assistance technology help Explorer maintain its position at the top of the SUV heap. Contact us for a test drive today, and see why the Ford Explorer has defined and led the mid-size three-row SUV segment since it burst upon the scene nearly thirty years ago.